This is why Twitter has a "Trust and Safety Council" (no kidding) designed to remove anything that isn't left-liberal friendly. Take a look at the Council members. The membership speaks to the true agenda. 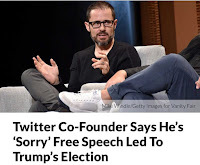 Make no mistake Twitter has an agenda and it is to silence users that are not in line with their leftist agenda. Just ask Milo. Also, isn't it just a little self-involved to claim responsibility? Trump won because Trump won. Not because of the Russians. Not because of Twitter. Just get over yourself. Addendum: Get on Gab as an alternative to Twitter bias.